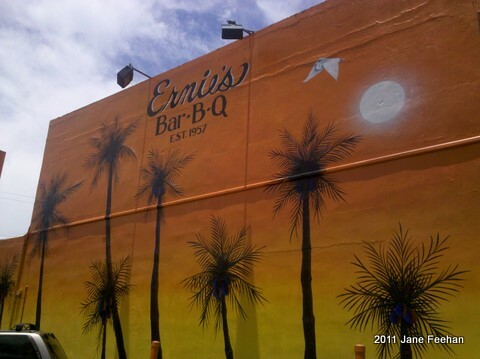 A Fort Lauderdale landmark since 1957, Ernie’s has been the place to go for things conch: conch chowder, conch fritters, conch salad. Bar-B-Q was always secondary. Many used to stop by because it was an easy-to-find party place with a balcony overhanging Federal Highway. A step inside today is to step into a place less cavernous, less funky than it was during the years so many referred to it as “Dirty” Ernie’s. Sixteen years ago, the same people who own the Floridian on Las Olas took over Ernie’s. Gone are the dark walls covered in writing; they’re in storage some place. Day-glo colors brighten an interior with lowered ceilings and serve as the exterior backdrop for an attractive palm tree mural. Several TVs line up across or near the bar. An outdoor patio squeezed in between the parking lot and front door beckons breakfast, lunch and dinner patrons. The menu is huge, and so are portions -- just like it is at the Floridian. 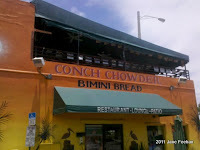 A few things remain the same: A cook has served up the same conch chowder and fritters for the past 35 years with the original recipe; the balcony remains open for dining and high-powered drinking and all that goes with it, and there’s still bar-b-q chicken, pork and beef and … that fluffy thick, faintly sweet Bimini bread. Yes, Ernie’s is different - yet somewhat the same. Service: Food delivered fast and hot. Fried seafood and children's menu available. Family-friendly (that’s different). 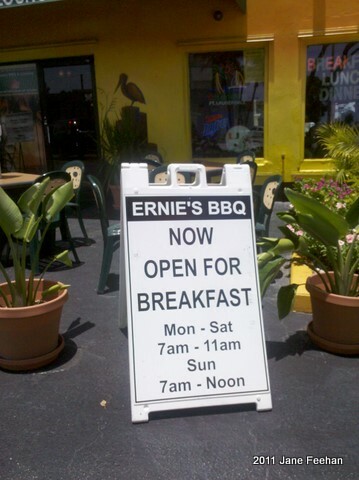 I loved the "old" Ernie's. The conch chowder was the best after 10 PM. Thick and savory. The bread in those days had black, sticky and sweet bottom crust that, I assumed, was do to reusing the baking pans without cleaning from the last loaf. One of my favorite "dinners" was a bowl of chowder, conch chowder and an order of conch fritters...Oh yes, a cold Bud draft to wash it down. I was shocked the first time we went there after the "clean up". I had never seen the inlaid terrazzo floors. They were beautiful. Nothing could replace the old Ernie's with the Marlin bills, fishing gear, shark mounts and all the memorabilia. It was dark, dirty and heaven. Does anyone have pics of the old writings on the walls?